Stakeholders have urged everyone to get involved in the demonstration next year. The National Housing and Homeless Coalition. A NATIONAL DAY of action against the homeless and housing crisis is being organised by a coalition of stakeholders on 7 April. He said the solution is obvious – “the provision of more social housing”. The protest is being organised by the National Homeless and Housing Coalition, which is supported by the organisations such as Focus Ireland, the Peter McVerry Trust, Merchants Quay Ireland, as well as a number of activism and trade union groups, political parties, actors and musicians. Coinciding with the launch today, a concert, highlighting the issue of homelessness, is currently being held outside the gates of Leinster House. Father McVerry said since the launch of the national Rebuilding Ireland strategy homelessness has got worse. Hitting out at the current Housing Minister Eoghan Murphy, McVerry said if he were running a business, Murphy would be asked to come up with a comprehensive plan to deal with the crisis and lower losses. Had losses continued to rise over the period of 15 months “he would be sacked,” said McVerry. He called on the government to start building on public land and to bring the building of social housing back under the remit of local authorities. McVerry said a law must be immediately introduced to stop all evictions until alternative accomodation is available, stating that it is the only answer the will stem the tide of homelessness. He said there are big issues coming down the road which will only exasperate the problem – such as the 47,000 mortgages that are now two years in arrears. “The emphasis on the private sector is absurd,” he declared. Speaking at the event, Councillor Tina McVeigh said the coalition is declaring their vote of no confidence in the housing policies of this government, and demanded a local authority led solution. 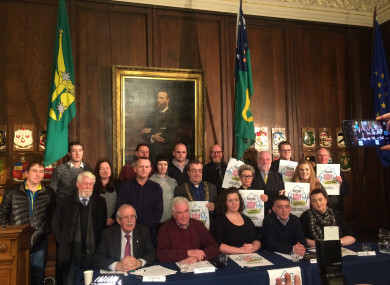 McVerry and the organisers of today’s meeting urged the public to get involved and voice their anger at the housing and homelessness situation. “It is time to come out in great numbers,” said Aisling Hedderman of the Dublin Bay North Housing Crisis group, adding that people in their local communities can get involved all around the country. A ‘Let’s Organise Our Communities’ event will take place on Saturday 10 February for people who wish to get involved. The national day of protest will take place on Saturday 7 April. Email “'Out of control': National day of protest against housing and homelessness crisis to be held in April ”. Feedback on “'Out of control': National day of protest against housing and homelessness crisis to be held in April ”.